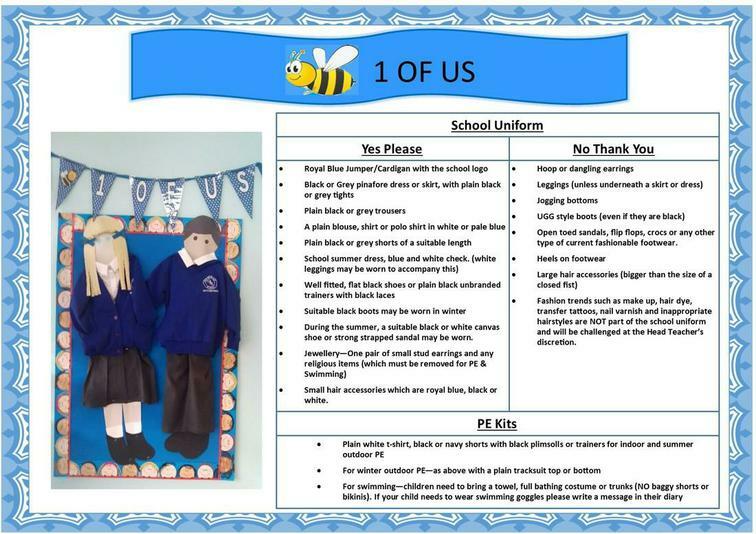 At Old Basford School, we believe that uniform is important and therefore wearing school uniform is compulsory. The school colours are Royal Blue, supported by White and Pale Blue. A plain blouse, shirt or polo shirt in white or pale blue. Plain black or grey shorts of a suitable length. Denim skirts, denim dresses or jeans of any type, corduroy and canvas trousers are not permitted. Fluorescent, patterned or very short shorts are not suitable for school summer wear. Well fitted, flat black shoes or plain black unbranded trainers with black laces are to be worn. Heels on footwear are not appropriate for school. Plain white t-shirt, black or navy shorts with black plimsolls for indoor P.E. Plain white t-shirt, black or navy warm plain tracksuit with black plimsolls or trainers. Pupils need to bring a towel, a full bathing costume, or trunks. All schools require written permission before any child can be permitted to wear goggles for swimming lessons. Pool regulations state that no baggy shorts, no jewellery, no bikinis may be worn and long hair must be tied back. No branded sportswear or football shirts of any kind are allowed for P.E. or games sessions. ALL ITEMS OF SCHOOL UNIFORM MUST BE CLEARLY LABELLED WITH YOUR CHILD’S NAME. No jewellery is allowed in school except for one pair of small stud earrings and any religious items. Children do need to remove jewellery on P.E. and swimming days. If you wish your child to have pierced ears, we suggest you do this at the beginning of the summer holiday, to ensure that they can be safely removed before P.E. sessions in the autumn term. The school will not accept responsibility for any personal injury sustained by the child, which is directly attributed to the wearing of earrings. All hair decorations must be kept small and in keeping with the school uniform colours. Fashion trends such as make up, hair dye, transfer tattoos, nail varnish, and inappropriate hairstyles are NOT a part of school uniform and will be challenged at the Head Teacher’s discretion. We want our children to wear their uniform with pride. The school requests that you send your child each day, neatly, cleanly and sensibly dressed for school. Examples of our school uniform can be seen in the slideshow photographs at the top of this page. Sweatshirts, Cardigans, and both Book and PE Bags are available to purchase from the school office. Please click on the link below for a copy our latest price list.